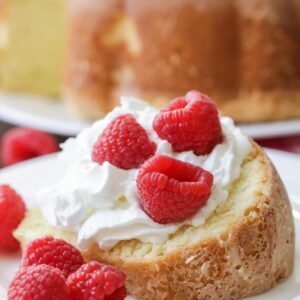 This delicious Cream Cheese pound cake recipe isn’t only easy, but is out of this world. It is so soft and flavorful and can be topped with any fruit or cream making it perfect for any brunch or event. 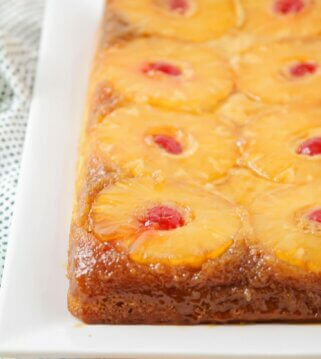 Who doesn’t love a good slice of pound cake? This homemade pound cake is fluffy but also dense with incredible flavor. 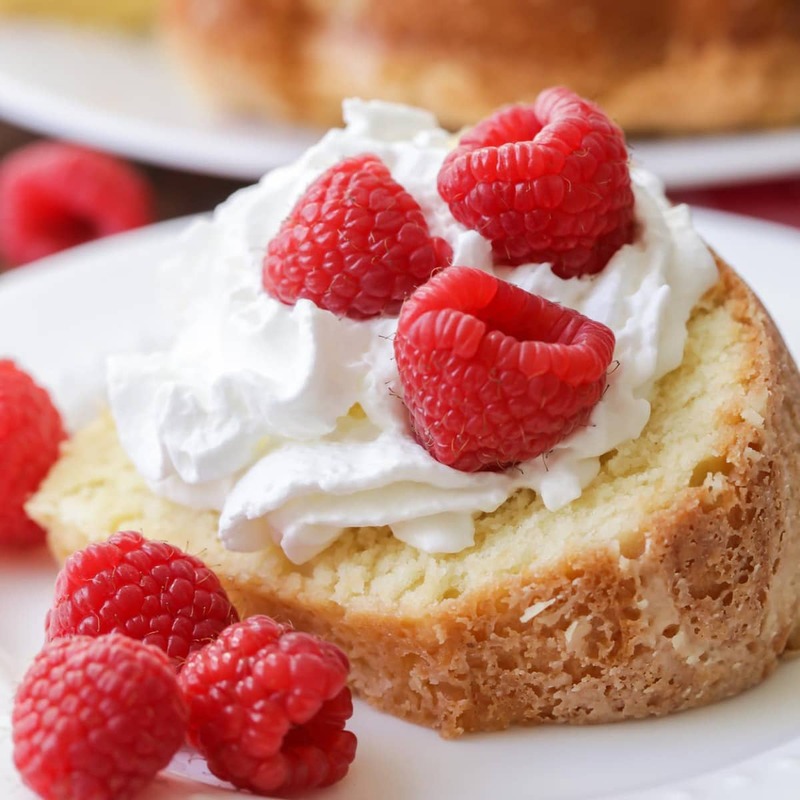 Top it with some whipped cream and raspberries and you’ve got one heavenly dessert. The picture speaks for itself…swoon! The simple ingredients in this recipe make it easy to make and totally delicious. I mean, can you really go wrong with butter, sugar, and cream cheese?? That hint of vanilla extract takes the flavor to another level of yum. I think this recipe will become one of your favorites. It’s definitely one of mine and one the entire family loved. 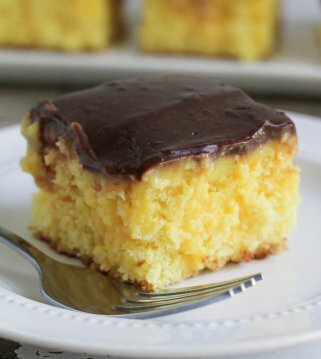 You will be surprised at how easy this cake is to whip up. You’ll definitely need a good bundt pan- don’t forget to grease and flour it! This will help the cake to pop out perfectly clean after its baked. There is nothing worse than a cake that gets stuck in the pan, am I right? After mixing all the ingredients and adding it to the bundt pan, put it in a 325 degree oven. 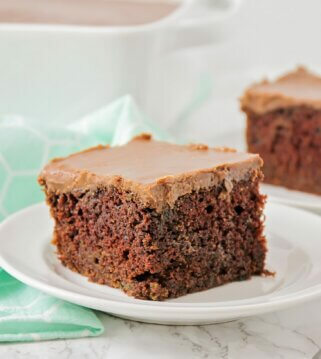 Take another baking dish, fill it with 2 cups of water, and set it next to the cake in the oven while it bakes. This will help the pound cake have that nice moist texture. No dry cakes here! Bake at 325 for 1 hour and 30 minutes until it’s baked through. Let it cool completely on a wire rack before slicing into it. This is the hardest part- waiting for it to cool and not being able to dig in right away! But don’t worry, it’s worth the wait. 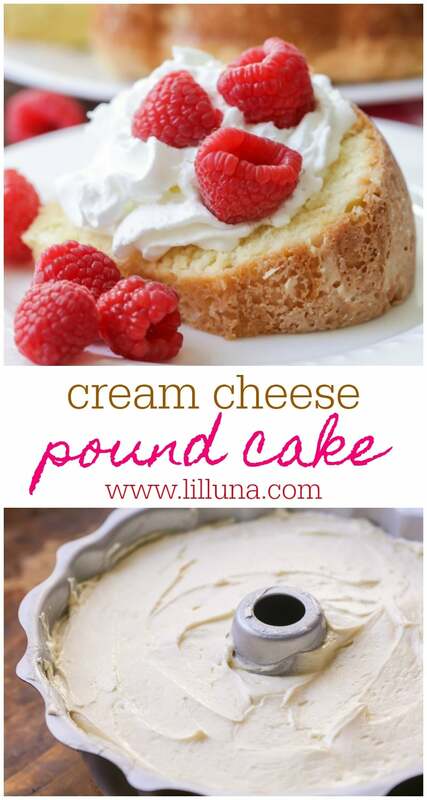 I can think of so many different reasons to make this pound cake recipe. But do you really need a reason? I think it’d be perfect to make for just an afternoon snack. Definitely bookmark this recipe to have on hand for family dinners, get-togethers with friends, and even a simple birthday cake idea! 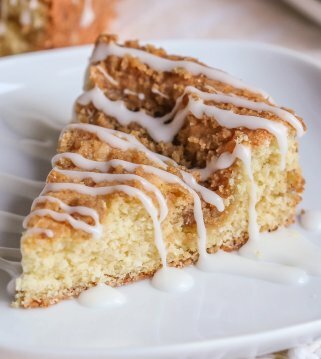 We hope you love every bite of this homemade pound cake as much as we do. 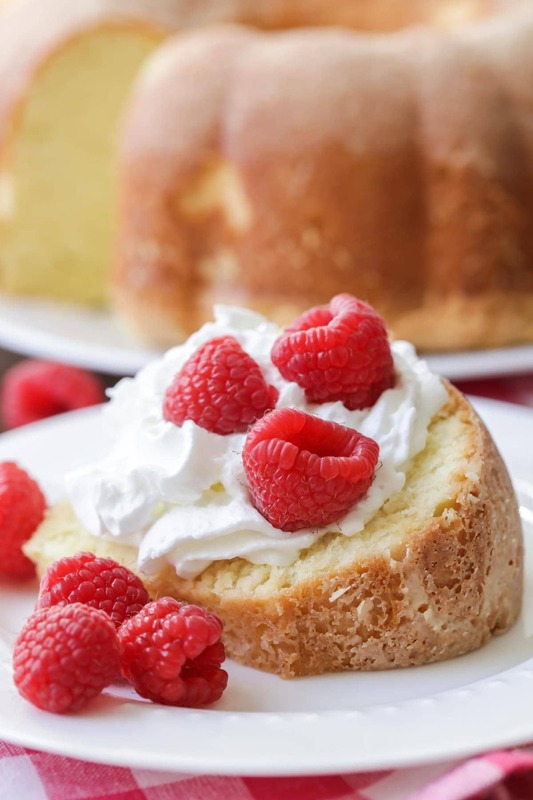 This delicious Cream Cheese pound cake recipe isn't only easy, but is out of this world. It is so soft and flavorful and can be topped with any fruit or cream making it perfect for any brunch or event. In a stand mixer (or with a hand mixer), beat butter and cream cheese until creamy. Slowly add sugar and beat together for 5 minutes. Add eggs one at a time. Stir in vanilla and almond extract. Sift together your flour and salt and beat into mixture until well blended. 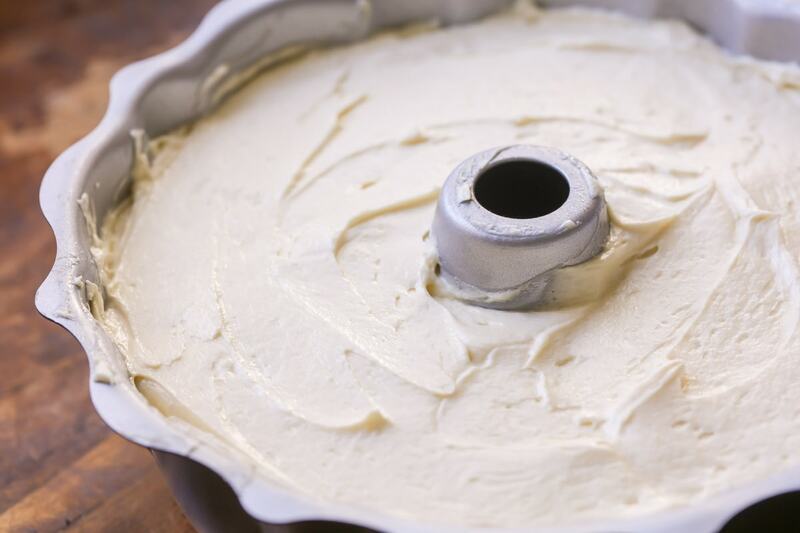 Pour batter into a bundt pan, greased and floured. Add 2 cups of water to a separate baking dish and set it next to the cake as its baking. Bake for 1 hour and 30 minutes at 325, until baked through. Remove from oven to a wire rack and let cool for 15 minutes, then remove from pan and let completely cool on the wire rack. Hi. Reading the directions for the Cream Cheese Pound Cake and it calls for almond extract, but almond extract is not listed in the ingredients. Also, it calls for a tablespoon of vanilla extract, that seems like a lot. 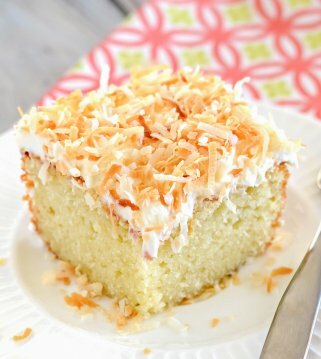 Is it possible to reissue an update of the recipe? This cake is so tasty! my family loves whenever we get the chance to make this recipe! Best pound cake Ive ever had. The cream cheese and almOnd exTract put it over the top. My favorite! Thank you for sharing that!! I am glad you tried it & liked it!! Yes, it should 🙂 Enjoy!